In 2018, Land prices in Bangkok were increased for 7.9%. However, it did not implied that the economy was good. The increase was due to the construction of mass transit systems. Land markets were imperfect but they were controlled by the sellers due to weak land taxes. 1. 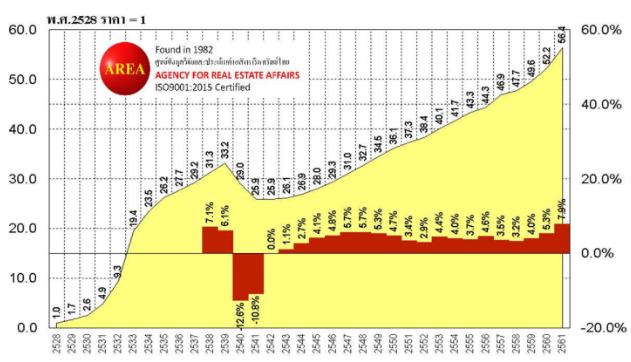 In 2019, land prices in Bangkok were increased 7.9%. This was the highest increase for the last 25 years. AREA conducted a thorough survey of some 400 plots during 1994 to 2018. 2. The area with the highest land price was Siam Square and land located nearby the BTS mass transit station of Siam Square, Chit Lim, Ploenchit and Nana. It was Baht 2.5 million (USD 79,821) per sq.wah or Baht 625,000 (USD 19,955) per sq.metre or Baht 58,064 (USD 1,854) per sq.feet. 3. Land prices were increased substantially since 1984 due to the transformation of the country from agricultural country to industrialized one. 4. Land priced were dropped in 1997 as a result of the Asian economic crisis. The prices were dropped for two years and then recovered. 5. Afterwards there was no decrease in land prices anymore. The increase rate might be somewhat different due to economic and political performance of the country. 6. However, due to massive construction of mass transit in recent years, land prices were increased particularly in 2018. It is expected that the prices would still be increased substantially in 2020 due to continued construction of mass transit projects. 7. Amazingly, land prices in the Central Business District (CBD) were increased at a higher rate than those in the outer areas due to the good networks of mass transit systems in the city proper. During 1998 to 2018, it was 132.9% in the outer areas; whereas, it was 266.2% in the CBD. 8. Land prices located nearby the mass transit station were increased around 11% in 2018; whereas, it was only 0% in some remote areas in the fringe with no mass transit or tollways. Due to the lack of effective land taxes, land were kept for speculation easily. The markets were controlled by the sellers. As observed, land prices were increased for 27.3% in one year in a new mass transit station opposite Ram Kham Heang University and another station. Consequently, condominium prices were increased exorbitantly which would be bad for home buyers. During the past ten years (2008-2018), the assets of the first 50 billionaires of Thailand were increased for six times; whereas, it was only 17% for average Thai households (https://bit.ly/2BSCtuu). This implies the gigantic income disparity. Hence significant land price increases did not imply the betterment of the General public.